So my beautiful baby girl is now 10 months old, and fast finding her own mind. I look back at photos taken in the first few weeks after she was born and cannot believe how tiny and helpless she was and how fast the developments occur, turning our wee babes in arms into proper little girls and boys. This month we have seen so many changes, including the ability to have a strop – this usually occurs when being put back into the pushchair after doing something fun, such as going on the swings, or Jolly Babies. On occasion she also objects to being put into her highchair. I must try and capture her ‘strop face’ on camera, it’s brilliant! 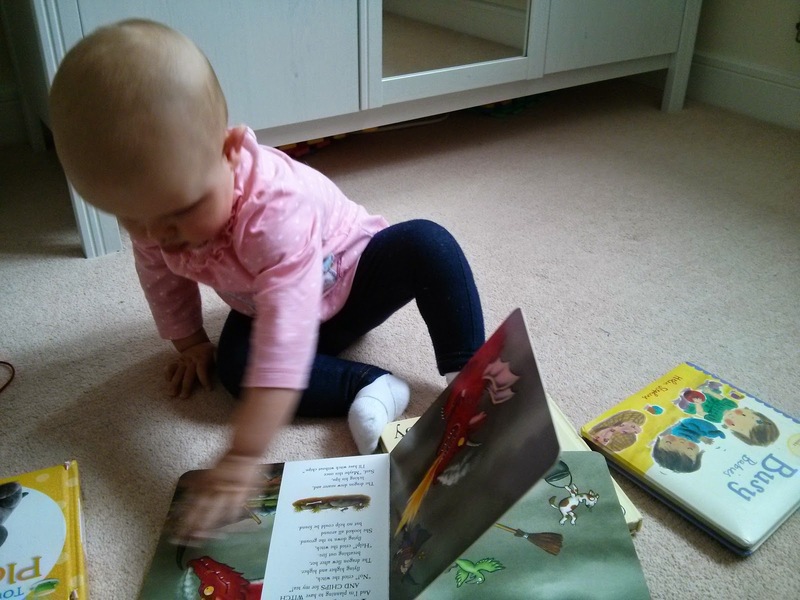 One of the most exciting developments for me this month was when she started to take a proper interest in her books (beyond chewing them) – she will now sit and look at a book, turn the pages and lift the flaps, it’s just brilliant! My little book worm. She has also started properly waving, in response to ‘hello’ and ‘bye bye’, which she proudly demonstrated at Jolly Babies last week. And if she has something in her hand and you ask “please can I have it?” she will offer it to you or place it in your hand. Just this past week she has begun to engage more with her toys, so she now rolls her ball back and forth with me, stacks her stacking cups and attempts to put shapes into her shape sorter. It’s just incredible how suddenly this stuff happens. Rosalie enjoying turning the pages of Room on the Broom at 42 weeks old.